Before taking any step further I will like to explain what the word HABIT mean “a settled or regular tendency or practice, especially one that is hard to give up”. As a human, we are a collection of our daily routines and habits. 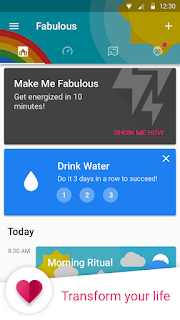 They are many rituals we perform in our day to day life’s and often cannot tell the difference between one day and another.Changing our lives means shifting these routines and this unique app,Fabulous- Motivate me can do they magic. The above question I believe has popped up in your mind when you saw this post title. want to share this app with you because a friend told me it did a lot for him in just a short period of time. And I agreed. Helooked healthier, seemed sharper and was generally happier than before. He told me that his work improved and so did his relationship with his wife. But could this really be attributed to an app? I had to give it a try. So I downloaded Fabulous and kept an open mind. 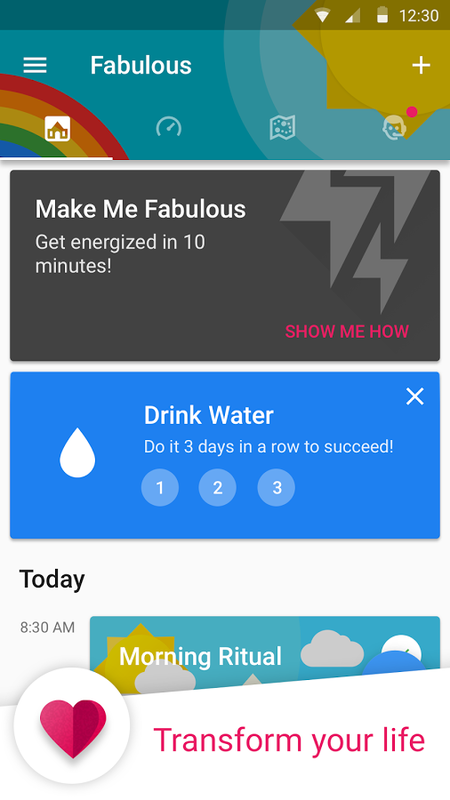 you’ve achieved enough improvements.Fabulous started my journey by showing me some brief reading material so I could familiarize myself with the science behind the process. Then itgave me some small goals that I needed to work on. One of the goals was to disconnect from my electronics 30 minutes before bedtime for three nights in a row. The app explained why I needed to do this – the screens from our devices make our brains think it’s daytime and it is then harder to get to sleep. I did everything the app asked me to do to improve my sleep. I know many will find this very hard to do hahaha Rewire your brain Once you finish the first goal plan the app will move you on to another. If I was tempted to try and tackle another ritual the app wouldn’t let me and gave me the warning: “I don’t want to overwhelm you”. I thought maybe I could just purchase some points or something, which is how most apps do it. Well, Fabulous wouldn’t let me. you had to follow the course slowly and correctly. I inevitably failed at a goal. it may be disheartening but the app will do an excellent job of picking you back up when you are down. It would take too long to elaborate how many ways my life is better with this app but I’ll give you one example. I started with the sleep journey and that was a smart idea because I was having so many problems with it.I wouldn’t get a good night’s rest and would end up feeling tired every morning. It took me longer to do everything throughout the day. I had a tough time focusing and even got irritable over nothing. I believe many youths will have this same sleeping problem like me. When it would near bedtime I would always be on my smartphone, PC orlaptop. In fact, the last thing I would do every night was checking my notifications. My bedtime routine was terrible but it didn’t change all at once. I slowly had to alter my behaviour over a few weeks with this app. The app methodically separated me from my electronics at bedtime and now I go to bed 30 minutes before my bedtime and have a healthy meditation routine before I fall asleep. These small changes in my sleep routines had a profound effect on the rest of my life. I started waking up feeling well rested almost every morning. In this technology age, we sometimes don’t have self-control at some stuff we do. Fabulous doesn’t try to upend your life. It instead wants to slowly steer it towards health and happiness a few steps at a time.